One of the many problems publishers of pay per click advertising face is with their cost per click. Ultimately, they would like their CPC to be as high as possible because it will make them the most money. But, in many cases, the CPC is extremely low being as low as a few cent. Although it doesn’t seem like it, publishers do have the control over their CPC and can in fact increase it. Here are six proven ways you as a publisher can increase adverts displaying on your website’s CPC which will consequently increase your earnings. Display Less Adverts – If you are displaying the maximum allowed amount of adverts being three units, there are more ad placements advertisers can bid for. Reducing this number will make the same amount of advertisers bid for less which will increase CPC. Use Text & Rich Media Adverts – Many publishers decide to only use text adverts because they feel that produces the best results. However, they forget that only big businesses tend to invest money into making rich media adverts and it is extremely unlikely they are going to have a low CPC for them adverts. Therefore, display text and rich media adverts. Apply an Ad Filter – You may find yourself doing everything possible to increase your CPC but still have no success. This is when you should you an Ad Filter. By removing advertisers that have a low CPC will sure enough increase it. Improve Your Website’s Pagerank – Google very much link PPC in with their search engine rankings. A website that has a pagerank of 8 will get a higher CPC than a website with a pagerank of 2. This is because Google knows the quality of the visitors and content on the PR 8 website will be better and will therefore produce better results for advertisers. Therefore, advertisers will want to bid higher for better quality websites. 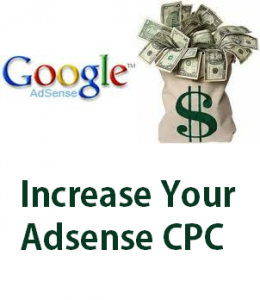 Say NO to Click Fraud– Your CPC may have decreased because your Adsense adverts are prone to click fraud. Therefore, try to decrease click fraud by changing the placement of your ad units or by simply stop clicking on your own adverts! High Paying Keywords – Some keywords will no doubt have lower CPCs than others. This is because of supply and demand and the different results different keywords produce. In a recent article, I pointed out how some advertisers are paying in excess of $55 for certain keywords! Therefore, it makes sense to try to make articles based around these keywords. If you take away anything from this article, make sure its that one of the biggest factors that determines the CPC of adverts on your site is your website itself. Advertisers won’t pay much for a website with poor quality content and a low Google Pagerank. They won’t pay much at all if it doesn’t have a private domain or isn’t professional in the way it looks. For this reason, when you search for a way to improve CPC for an Adsense publisher, don’t think the small tweaks will have such a big difference. The truth is they won’t. What will have the biggest difference is what you do to your website. Build quality content and sure enough, your pagerank will improve increasing your average CPC.